Tag Archive | "Lake Kutubu Rainbowfish"
The Lake Kutubu Rainbowfish (Melanotaenia lacustris) is known by tropical fish keeping enthusiasts as the Turquoise Rainbow or Blue Rainbowfish, and is only found in Lake Kutubu and its outlet in the southern highlands in Papua New Guinea. Lake Kutubu is fed mostly from underground springs that filters through a limestone substrate which creates a highly alkaline (pH 8.5-9.0) environment for the species. The Lake Kutubu Rainbowfish is a strikingly colored fish with a beautiful intense cobalt blue or blue green (teal) on the upper half of the body,fading to a silvery white to gold on its lower half. They have large eyes that is a characteristic of all rainbowfish, a black or silver band that runs through the middle row of scales at their lateral line, two dorsal fins and a deeply forked mouth. Their fins have a slightly blue tinge with black edges that show up during spawning. Unlike other rainbowfish species, Melanotaenia lacustris is capable of rapidly changing its colors in a matter of seconds and can throughout the day can display many different color patterns. Lake Kutubu Rainbowfish are very active swimmers and should be kept in a tank of at least 30 gallons however, because of their size when fully grown, a 55 gallon tank is recommended as the minimum for housing a school of adults. 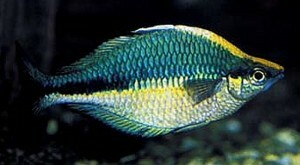 Turquoise Rainbowfish do best in a single species tank with at least 6 or more of their own kind. Because of their “Vulnerable” status on the IUCN Red List of Threatened Species, and to prevent cross breeding, they should not be mixed in with other species of rainbowfish. Melanotaenia lacustris can also be housed in a community aquarium and are compatible with similar sized species such as the Tetras, Rasboras, Danios, Discus, Angels, Barbs, Dwarf Gouramis, Livebearers, Corydoras, Plecos, and other species of scavenger Catfish. dark colored sandy substrate, some bogwood , a few smooth river rocks and plenty of swimming room. They need hard, alkaline, well filtered water with little to no water movement at a temperature of 70-77 degrees F. When planting the aquarium, choose species that can tolerate the water conditions needed by these fish. Sexing juvenile Lake Kutubo Rainbowfish is difficult, but as they mature the adult males are more colorful, become more aggressive, and develop an arched back typical of the species. 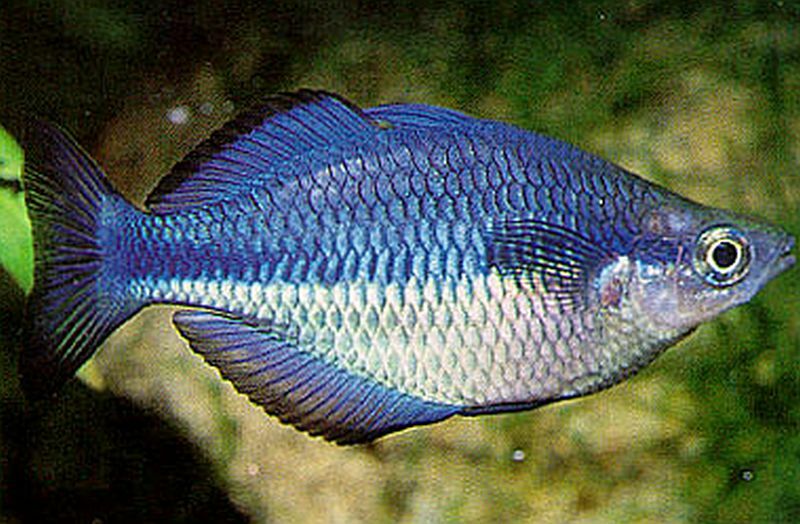 Breeding Lake Kutubu Rainbowfish is a relatively easy proposition once a pair is identified. 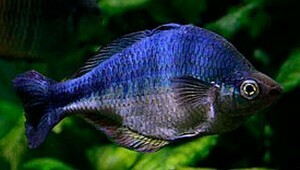 Place a conditioned group of two females to three males into a breeding tank with some fine leaved plants, Java Moss , or a few spawning mops and raise the water temperature to about 78 degrees F. When the females have produced eggs, the males will display their intense colors and urge the female to a spawning site, spawn and then rest. The process will be repeated for a number of days until egg production ceases. As the eggs are deposited, remove them from to a breeding tank with a seeded air sponge filter. The fry will hatch out after ten days or so and are will be free swimming 24 hours later. Feed the tiny fry infusoria or finely crushed flake food until they are able to consume newly hatched baby brine shrimp. The fry grow slowly, even under ideal conditions. In Lake Kutubu, Turquoise Rainbowfish feed on small crustaceans, insect larvae and algae. In an aquarium environment they should be offered a balanced diet of live, frozen and freeze dried daphnia , brine shrimp, bloodworms , tubifex and quality pellet or flake foods. Feed them only what they can consume in 3 to 4 minutes, several times a day in lieu of single large portions. 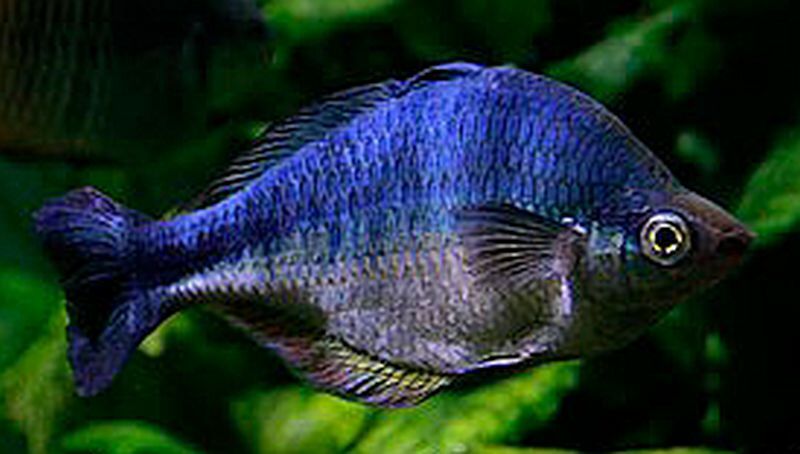 The Lake Kutubu Rainbowfish is sold to tropical fish keeping enthusiasts as juveniles under the names Turquoise Rainbowfish or Blue Rainbowfish. They are somewhat difficult to obtain and demand higher prices than other species of rainbowfish.